Senior Kyrstyn Peugh knows the Pahrump Valley High School Rodeo Club covers a lot of miles during the school year. During the fall, there were rodeos in Battle Mountain, Ely, Elko, Spanish Springs, Alamo and Boulder City. And, after opening the spring at home, they spent a weekend in Fernley. Special to the Pahrump Valley Times Pahrump Valley senior Kyrstyn Peugh competes in pole bending at a rodeo March 9 hosted by Fernley High School . 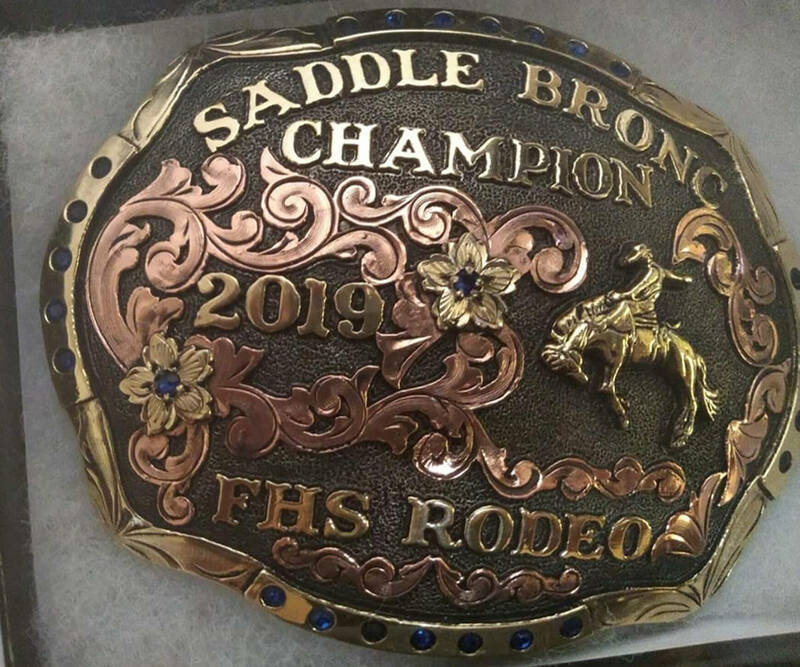 Special to the Pahrump Valley Times Pahrump Valley senior Tye Hardy added to his buckle collection March 9 by winning the saddle bronc competition. Hardy took over the state lead in that event with his victory in Fernley. 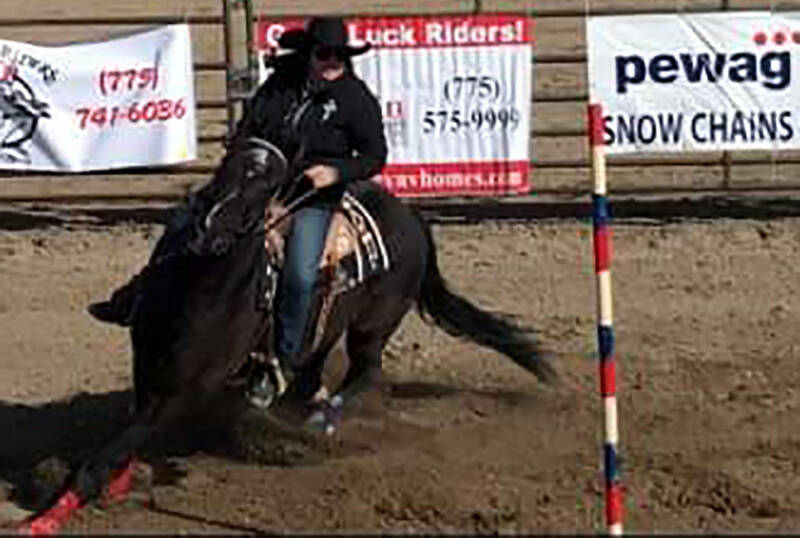 Peugh ran the first day of the Fernley rodeo, posting times of 20.804 in pole bending and 20.6 in barrels, but did not run the second day because her horse was hurting. Fellow senior Tye Hardy’s highlight of the weekend came in his “other” event. The state’s top high school bull rider, Hardy was the only competitor to post a score in saddle bronc riding. “Tye finally covered his saddle bronc,” Peugh said of Hardy, whose score of 59.0 on Sunday gave him 20 points and put him atop the state’s saddle bronc leaders. Hardy also competed with Jakob Feiner in team roping. “They caught the second day with a 16 but did not catch the first day,” Peugh reported. In the junior high school rodeo, Pahrump’s Tylar Trausch’s barrel racing efforts resulted in a 23.928 Saturday and 18.819 Sunday, good for 13th place. Brandon Mountz did not cover Saturday and did not ride steer Sunday because of an elbow injury, Peugh said, but he remains the state’s leading bull rider and is sixth overall in steer riding. “The whole team actually did pretty well,” Peugh said. The club will compete this weekend in a rodeo hosted by Moapa Valley.